I bought a pack of Everly Brother's CDs - there are 75 of their recordings. I've always liked their harmonies and John Lennon once mentioned how he and Paul were influenced by them. I played one of the CDs and the song Ebony Eyes, about Flight 1203, made me smile - even though it's supposed to be a weepy. When my son was small I had this song on a cassette which I played in the car on the way to the airport, when we were going on holiday. I remember Karin told me not to play it again, as she's not too keen on flying at the best of times, so the song didn't help. Of course, my son wanted the song again! Anyway, since that time I've always wondered what happened to Ebony Eyes and if the soldier, who was waiting for her, ever married someone else and - oh, okay I wasn't really too bothered but yesterday I did wonder if the song was in any way prophetic regarding any Flight 1203. I did a Google search and didn't discover anything about Flight 1203 - but I did find out what happened to Ebony Eyes. What a relief. She's okay! I found out that the Beverley Sisters did a song about Flight 1203, goodness knows how long ago - no doubt cashing in on the Everly Brother's number at the time. It was the first time I'd heard it and it seems that Ebony Eyes missed the flight! 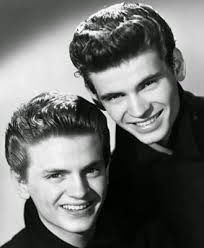 P.S.The similar names of the Everly Brothers and the Beverley Sisters is a coincidence. The sisters signed a record deal back in 1951, way before the brothers released their first single. I never heard of the Beverly Sisters! But certainly do enjoy the Everly Bros! The Beverley Sisters are an English trio - they never appealed to me. The similarity in names is weird!